Foreign ministers discuss broader situation in Middle East. 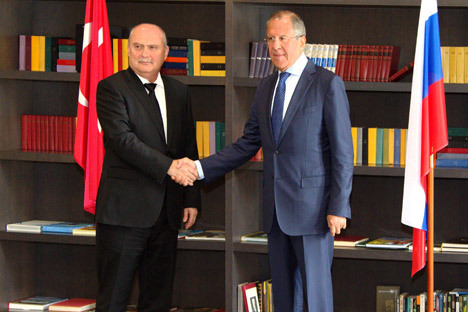 Russian Foreign Minister Sergei Lavrov held a meeting on September 17 in the southern resort town of Sochi with his Turkish counterpart Feridun Sinirlioglu. A key topic of the talks was the ongoing situation in the Middle East. Following the meeting Lavrov said that Russia and Turkey are interested in initiating a full-fledged political dialogue on Syria under the auspices of the United Nations "in accordance with agreements that were achieved with the participation of the Russian Federation and Turkey” in 2012 as part of the so-called Geneva Communique on Syria. The ministers also stressed "the inadmissibility of the acquisition of new territories by terrorists." Moscow supports the formation of a broad anti-terrorist coalition in the region against the Islamic State group. "Despite some differences in approach on certain aspects of the Middle East situation, we have common goals,” Lavrov said. “They lie in the fact that we want to see this region as stable, democratic." The discussion on the Syrian issue could continue next week when Turkish President Recep Tayyip Erdogan arrives in Moscow to take part in the opening of a new mosque. The ceremony will be held on September 23.